You know what I love most of all? While BL and I are both morning people, there is nothing like waking up feeling refreshed, especially since the weekend means we get to snuggle under the covers for a little longer. Weekend mornings also mean breakfast, a real breakfast- not the on-the-go mis-match meals I usually throw together for weekdays. Since the weather is a cool enough to run in the afternoon, we have been forgoing our normal weekend morning run for a larger breakfast instead. And Pumpkin-Maple Oatmeal is definitely on the menu. I made this oatmeal last weekend, just threw the ingredients together on Friday night so it would be ready in the morning. Do you know how amazing it is to wake up to your house smelling like pumpkin? And maple syrup? I literally threw off the covers to run downstairs, grab a bowl, and rejoin BL in bed. While Pumpkin is everything in Fall, it’s flavor is heightened by the use of 100% natural maple syrup. I can’t imagine using any other sweetener in this one-pot dish. Rich, flavorful syrup that is reminiscent of caramel. So delicious, I drizzled extra over the top. A pool of maple syrup for my pumpkin oatmeal to swim in? Yes please. Why maple? Well, as I shared last week with you, pure maple syrup is my go-to sweetener of choice. Besides being more complex in flavor than agave, brown rice syrup, honey or the like , maple syrup also contains 54 antioxidants. 54! That’s as much antioxidant activity as a raw tomato or broccoli… can we start calling this a super food yet? While comforting enough to satisfy my desire for a hearty breakfast, it was also the perfect fuel for our early afternoon run. 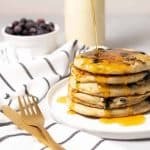 Compared to other sweeteners, it also contains more manganese and zinc, essential for muscle recovery, and potassium, needed to regulate fluid balance. 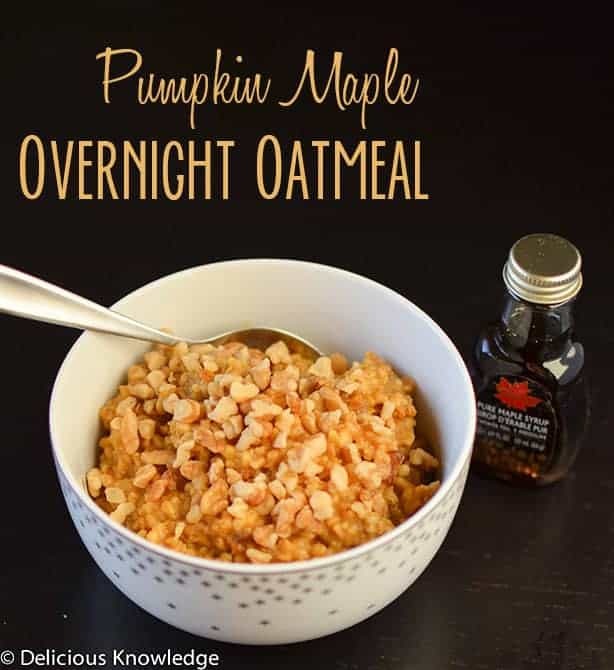 So, start your weekend off right with my pumpkin-maple overnight oatmeal. Don’t have a crock pot? No worries, just combine all ingredients on the stove and cook until oatmeal is tender. 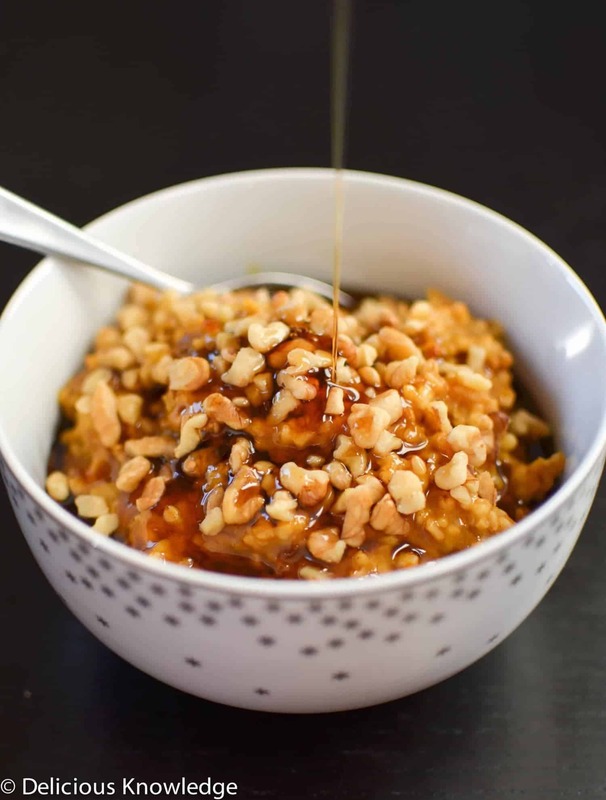 Start your weekend off right with this pumpkin-maple overnight oatmeal. Don’t have a crock pot? No worries, just combine all ingredients on the stove and cook until oatmeal is tender. Combine all ingredients together in the base of a crockpot bowl. Place on low, cover and cook 6-8 hours until done. 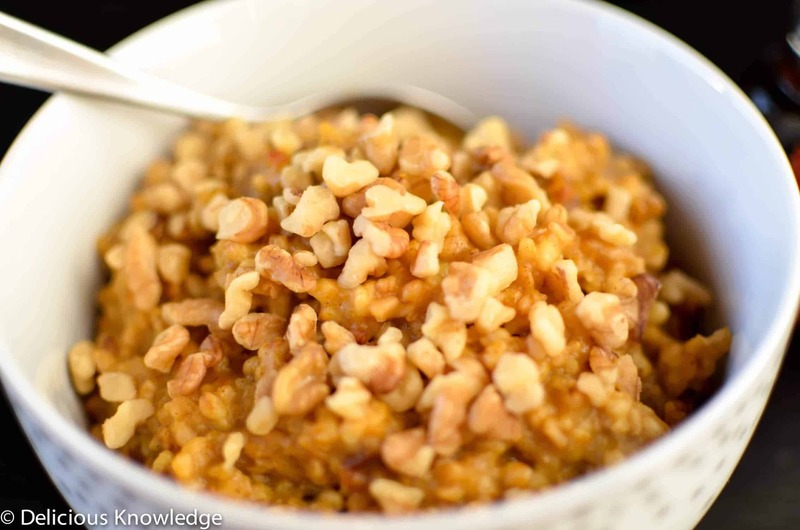 In the morning, stir oatmeal with a fork to loosen the steel cut oats and make sure everything is fully incorporated. Top with more pure maple syrup, walnuts or splash or two of cold milk and enjoy! For easier clean-up and to avoid the slight “crusty” residue inside the slow cooker, place all ingredients in a glass bowl that fits into the slow cooker then add enough water to fill the lower half of the slow cooker. Cover and cook on low for 6 to 8 hours. This post was sponsored by Pure Canada Maple Syrup. However, all thoughts and opinions are my own. Overnight oats are my go-to during the week, but I usually just top them with some fruit and chia seeds. I’d love to give this combination a try. I’d love to wake up to the smell of maple syrup! I think you may have just sold me on getting a slow cooker (definitely when i read the sentence about waking up to the smell of pumpkin). I’ve made overnight oatmeal before, but it was a very different version. It consisted of adding almond milk to raw oats and leaving it in the fridge overnight. It was good, but much more suitable for summer, because it was to be eaten cold. I like this warm hearty approach to oatmeal much more for the fall. I have all the ingredients at home, so I will try making it on the stove next time. 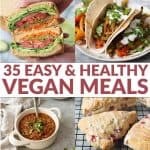 This will be so great for my husband who loves everything pumpkin and oatmeal and so easy to make to boot. Thanks for sharing. Thanks for this wonderful recipe Alex! Seems to be quick (after the initial cooking), yummy and so good for you. I love all these seasonal flavors. Can’t wait to try it! I made these last night, and they did not turn out. Did I do something wrong? They seemed really dry, I even added some water to them. When I woke up this morning they were burnt to the bottom of my crockpot. Help? Oh no, did you have to add more than the 1 1/4 cup water? Other thoughts- what kind of syrup did you use? If it was a pancake syrup it might burn to the bottom. What setting was your crockpot on? I will try to make this again this week and update any changes if need be. I apologize that it didn’t work well for you! Looks delicious! Does anyone have the nutricional info? Calories? Thank you. Hi Nancy, per serving (2 servings) 244 calories, 1.7g fat, 55.6g carbohydrates, 4g fiber, 3.5g protein. I am going to try this, not for breakfast but for dessert! I am to bring a dessert to a dinner party and I thought that this w/ a scoop of vanilla ice cream would be a different approach to a crumble. Thoughts? Sounds awesome! Please report back and let me know how it works out! For transport you might want to consider making everything in a separate pot to place in your slow cooker. Then add water around the pot. Then you can just bring the pot and ice cream to the party! I have another baked oatmeal recipe (not slow cooker) here that I’ve topped with ice cream before! It was delicious!